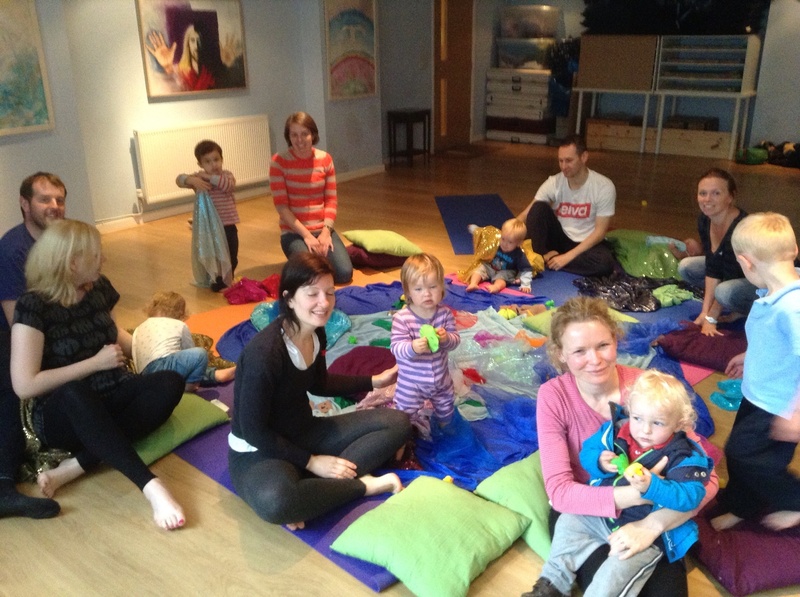 Harnessing their love of rhythm and rhyme, the classes include lots of songs and verses , as well as massage, stretching together, wriggling, jumping, running and flying! There is always a lot of smiling and laughter! Children can dip in and out of the action, at their own pace. Some love to copy and watch, others observe from a distance! Mum/Dad/Granny might be busy yoga-ing while their little one might be off investigating the room, knowing that they will still need to come back to them for cuddles, and that they won’t be able to resist climbing on them whilst they are in a yoga pose. The classes also include fun and challenging elements like inversions on the backs of the grown-ups, butterfly swings, or zooming to the moon, even a cautious Tot will decide to try them when they are ready. For older children they can copy more traditional yoga poses on their own and join in with sun salutations. We always end with a lovely relaxation. Even the busiest bee will lie down with their favourite grown-up under a sparkly blanket with a comfy cushion when they see everyone else doing it too. If you have more than one child under 5 they are all welcome. Babies can join in too! You don’t need any yoga experience, you don’t need to be bendy! Equally, if you have done yoga before it will give you some ideas for reintroducing it into your life with your Tot! 1:1 tuition and bespoke sessions for groups available upon request. I would be very happy to discuss your requirements further. Yoga is not just for stretching, we can incorporate many elements of the EYFS into the sessions, and explore themes, books, stories or numeracy. Children learn best while moving! What are the benefits of yoga in my setting? As well as being perfect for encouraging the children to be active during their day, yoga helps focus and calm the children. They develop confidence as they learn to do clever things with their body, and tools for calming themselves. I aim to encourage children to develop body awareness and a social and emotional vocabulary through yoga, for example, naming the body parts we can feel working when we do yoga, counting the limbs which are on or off the floor in poses, naming feelings , noticing and respecting how we are that day, encouraging them to rest at any time, discussing the benefits of working harder and feeling our hearts beating faster. I am interested in your autumn Tuesday toddler class. Please can I have details of when it is starting etc.